Jingle Jangle! Bing Bang! Ding Dong! Jingle bells are all around us as Christmas time comes our way. Every time I here the Jingle Jangle of jingle bells I think of Santa's sleigh and the jingle of the bells around the reindeers necks. Santa Clause is letting us know he is on his way. To get in the festive mood, it is fun to make some jingle bells of our own. There are many easy way to make these bells, you can make representations of jingle bells with just simple construction paper or you can make working one with bells and muffin tins or paper cups. Find some inspirational ideas below. 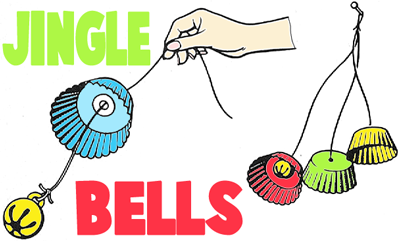 To make these Christmas Jingle Bells, you will need to gather a few things...3 paper baking cups of assorted colors, a pencil, 3 small bells (Christmas-sleigh type), 3 pieces of string 8", 10" and 12' long, and 3 gummed reinforcements (the kind that you put on loose leaf paper when the hole rips). With a pencil, poke a small hole in the center of each baking cup. Paste a gummed reinforcement over each hole, on the inside of the cup. Tie a bell to one end of each piece of string. Run the opposite end of each string through the hole in one of the cups, so that the bell is inside the cup. Make three bells. Now tie the strings together at the top and hang the bells where the wind will blow them lightly and set them jingling. Here is a cute craft to make Xmas Bells. First print out this template. Cut it out. Fold tissue paper or any thin paper so that a number of bells may be cut at one time. Cut Fig I. Paste tab A over on point B. 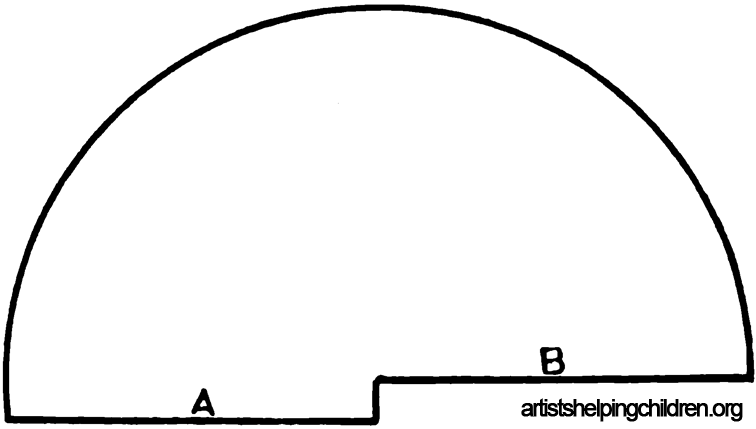 Cut in about 3/4 of the way on each side alternatively, following the contour, as below in Fig. III. Open carefully, and draw down slightly from lower edge. Run a thread through the top at point X, and leave end with which to swing the bell. Fasten a small bead on other end inside bell for a clapper or tongue. The bells may be cut any desired size. The small ones are useful in trimming the Christmas tree, or as a table placeholder or party favor. 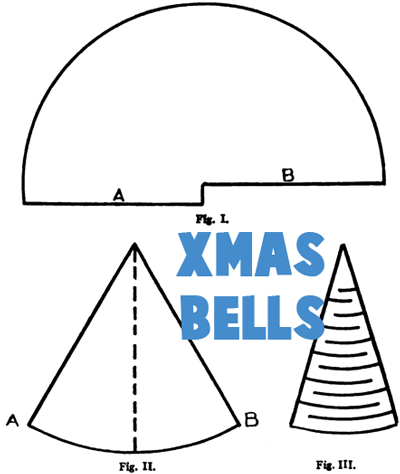 Paper Folded Xmas Bells - Make a ton of these bells to celebrate for Christmas time. Create Xmas Bells from Drinking Cups - There is a lot of creativity that you can do to make a really festive Christmas Bell. Make Papier Mache Bells for Christmas - Mold your bell and make it last forever by using papier mache techniques and then painting it.